Happy 2013 everyone! I am expecting good things from a year with my favorite number in it. 13 has always treated me well so I hope the trend continues! I head back to Florida tomorrow after an awesome time at home seeing family and friends for the first time in a long time. I always love to come home and see what’s new and visit all my favorite places. Sadly, issues with health meant I couldn’t eat all my favorite things this time around but I am hoping to get home over the summer so I’ll just have to eat double then. I even made it up to the Carrier Dome for an SU Basketball game through a semi-blizzard. It renewed my CNY street cred for sure. This coming semester is going to be busy and challenging at work but I am looking forward to it and hoping to have a lot to show for myself come summer (fingers crossed!). As for reading, I’ve put my Goodreads Reading Challenge at 110 books. I decided to be realistic and not push myself too hard this year as I really want to continue to focus on my to read list rather than the numbers like I needed to at the end of last year to get my challenge met. It should be a good reading year indeed! I am off to enjoy my last day at home before a day of travel tomorrow so I hope everyone has a wonderful and safe New Year’s Day! In case you have some true believers still around when you read this – beware! As a character on one of my all time favorite shows is fond of saying, Spoilers! 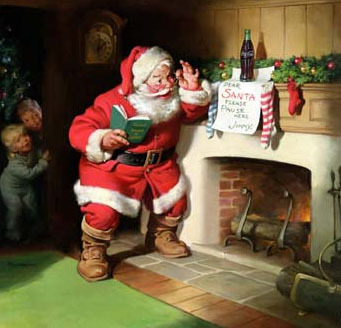 So, it was my younger sister who told me that Santa Claus might not be as real as I would like. I’d had inklings of course, I’m not that daft, but I didn’t really want to not believe. I loved the magic of Santa and leaving out cookies and milk with sugar for the reindeer. Writing him a note to leave on the table, hoping he and the reindeer were having a good night. There was nothing quite like getting back to my house on Christmas Eve from my grandmother’s and rushing off to bed because the next day was going to be the best day of the year. A little magic is lost when I realized that the presents had been moved from my grandmother’s during the Christmas Eve festivities, that your dad was the one who ate the cookies and that your mom was the one who left the note, written with her left hand so we wouldn’t recognize the writing. But, on some level, I made a deal with my eight year old self. OK, so there wasn’t a physical being called Santa who came down my chimney but the idea of Santa and everything he stands for? I’ll believe in that until the day I die. Because, well, I don’t want to live in a world without a Santa Claus, without that possibility of magic and kindness and miracles. In fact, I think the world could all use more believers in things like that. This was long before I read Yes, Virginia, There is a Santa Claus but obviously that is an editorial after my own heart. In fact, I consider it required reading about this time of year. So, that little piece of my heart that is eight years old forever still gets excited for Christmas Eve and that moment when I get to go to bed. I know Mom and Dad are out in the family room putting out the gifts but I still love going down the hall and seeing it on Christmas morning, the mountains of gifts radiating from the tree and the overflowing stockings sitting in the easy chair because they are too heavy to hang back up. Even now, there is no room more magical than the family room all lit up on Christmas morning with snow out the window. The snow though is becoming more rare (curse you global warming!). But one of the best parts of the season is that we still have little ones in the family who truly believe. For years, I was Santa for my cousin. I’d call to get the inside scoop on his school and friends and things he’d done that year and then write up a letter from Santa to send to him. I loved coming up with the picture of the North Pole for him. I usually re-read some of them about this time of year too. It was fun to think up why elves would be putting together an iPod or where a sports jersey might come from if Santa needed one. Today’s kids are smart – you have to stay ahead of them! While my cousin has long outgrown those letters, I still get to hear from my other little second cousins about their excitement, about all the things they found on Christmas morning (paw prints in the yard! half eaten carrots!) and to share for a little while in that absolute certainty that of course Santa exists, how could he not? As I head home for the holidays, I wish all of you and your families the very best and magical moments the season has to offer. Happy Christmas Everyone! As you should know by now, going to Walt Disney World for me is the equivalent of getting to go to a second home. I know those parks, those rides, and all those good eats as well as I know my hometown. At Christmastime though, it becomes something even more magical. I haven’t been to WDW at Christmastime in 12 years. Think about that Disney people. The last time I saw the Osborne Lights they were on Residential Street, Snow on Main Street was still novel and there was that great theater back in Tomorrowland for the Mickey’s Once Upon a Christmas show. There was also, gasp!, no Holiday tag to Illuminations which I think might be the most tragic thing of all. OK, so what was my favorite part of all the new holiday things I saw…that would be like asking me to pick only one favorite book. 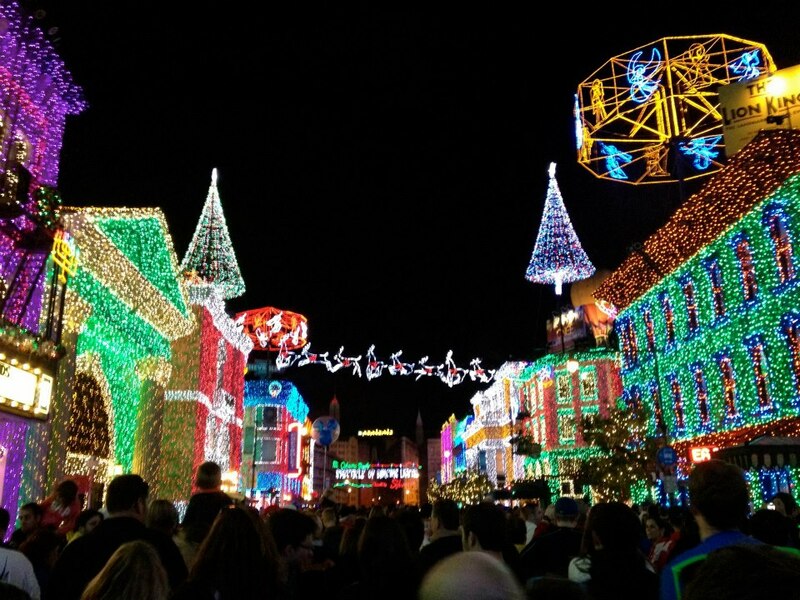 I adored the new location of the Osborne Lights on the Streets of America. The snow added a nice touch but I especially like the “dancing” lights (which is apparently it’s official name now…who knew?). Every 10-15 minutes, the lights “dance” to a song. It was fun to watch and see what they would do next! We also got there just in time for the lighting which I liked seeing – I think some of the impact is lost if you were to just wander in. Seeing all those lights come on at once was truly incredible. Next, is Epcot. This is my favorite park anyway but add in the Christmas element and it’s even better. I wish I’d had more time to go and watch all of the little shows in each country. We caught part of the show in Norway and their mischief maker Santa was fun to learn about. Also, apparently, you leave out Porridge and Ale for Santa in Norway. That is one St. Nick that knows what is up! We also didn’t have time for the Candlelight Processional but that is at the top of my list for next year. It’s something I know I will adore. I didn’t make a big push to see it this year because I missed the narrator I would REALLY love to see by a day. Next year Neil Patrick Harris (and if you don’t come, I will cry). Now, Holiday Illuminations. I love fireworks, well, let me rephrase…I love Disney fireworks. To see non-Disney fireworks is just sort of sad actually but I digress. As I was saying, I love Disney fireworks and Illuminations happens to be my favorite of them all. Holiday Illuminations adds a tag at the end. It is AWESOME in the true sense of the word. I don’t know that I’ve ever seen so many fireworks! 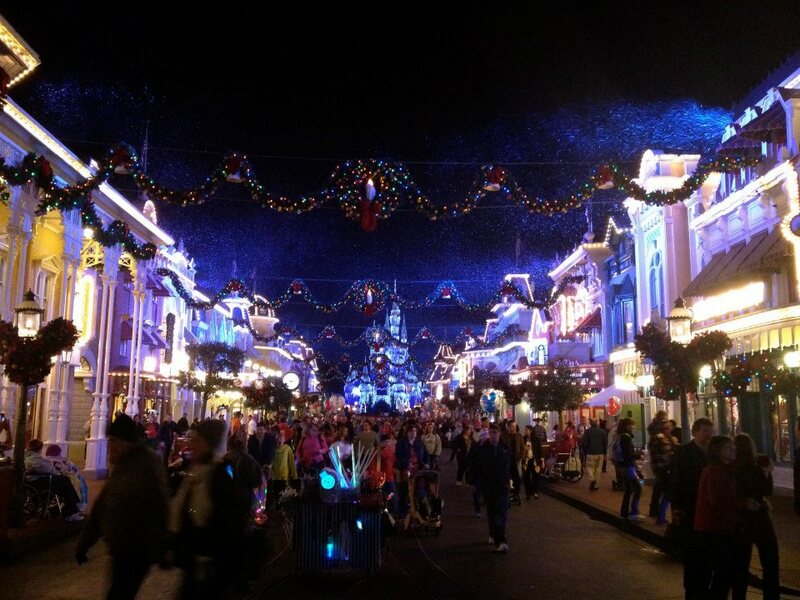 And as always it goes beautifully with the music and adds a truly magical element during the holidays. We actually saw this twice and it was totally worth it! But wait! I forgot what I think is my favorite part of the Magic Kingdom at Christmas time. The Castle lights. 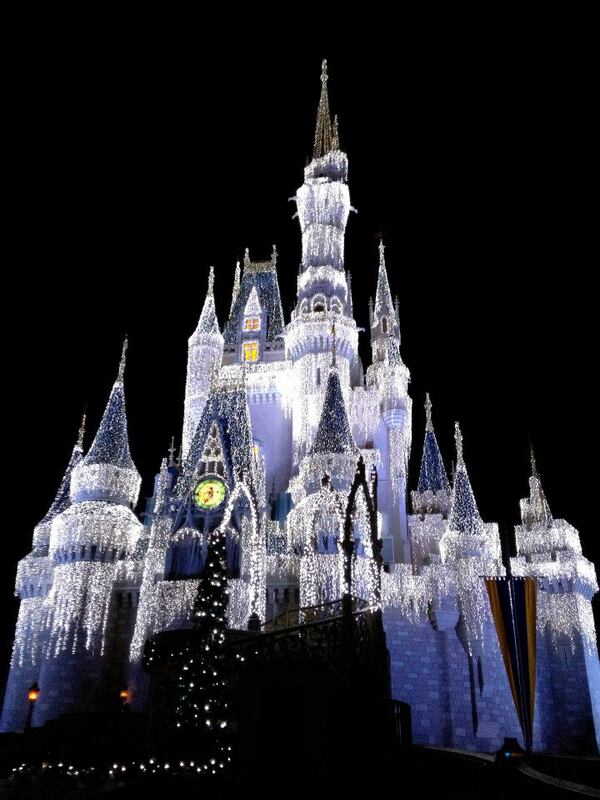 A few years ago, Disney “iced” CInderella’s Castle with white lights to make it look like ice hanging all over it. We didn’t watch the lighting but it was truly a magical sight to see when we walked up to the Castle after eating. The lights will vary throughout the night but I think I prefer the blue best – truly makes it look like an iced confection! So, I am in the middle of watching the second season of Chuck and enjoying crushing on yet another geeky character. I also am in the middle of Jane Green’s Bookends. So look for reviews and updates coming soon. Enjoy your holiday weekend! I hope everyone had a safe and happy 4th of July holiday. Mine started a bit early as we were let out of work on Thursday at lunch time. I took the opportunity to wander the Smithsonian’s Folklife Festival on the Mall. I had fun wondering the tents with artisans from Bhutan but I really enjoyed the NASA tents. I got to speak with several astronauts and scientists about the International Space Station and NASA’s plan to get man back to the moon by 2020. After I wandered, I keep walking to see some of the monuments as I hadn’t really done that yet since I got down here. I walked past the Washington Monument and on to the World War II Monument which I had not seen yet. It was beautifully done – very open and lots of water fountains and falls. The two sides represent the Atlantic and Pacific theaters with a separate pillar for each state and territory that sent men and women to fight during the war. A lot of the area was blocked off however I think this was because of the fourth of July – they launch the fireworks from the reflecting pool, only a short walk away from the monument. I continued on and walked through the Vietnam Memorial next. This memorial always makes me slightly uncomfortable but always in awe. There are always people taking rubbings and this time an entire family had come to place flowers under what I gathered was a son’s/uncle’s name. It’s a very emotional memorial to walk through. I next hiked on to the Lincoln Memorial and the Reflecting Pool. This whole area was a bit of a mess – it was fenced off for the fireworks and also they are doing some sort of road work it looks like in front of the monument so it’s less than aesthetically pleasing currently. I climbed up all the stairs to the inside of the monument to see the statue of Lincoln and to read the Gettysburg Address on one wall, the other had his second inaugural speech on it. I also ducked into the exhibit under the monument (mostly to cool off to be honest) but it displayed quotes of Lincolns as well as video of the more momentous occasions that have happened on the steps of the Monument. At this point, I could go no further so TJ’s monument gets put off for another day. I started my way back up Constitution and when looking for a metro station, I found the Corcoran Gallery which was on my list of museums to visit. This is the first museum I’ve had to pay for since I came. For me, it was worth it though. I liked this museum’s collections of American art a lot and I also liked the special exhibition of photography and film taken by several journalists in countries hit particularly hard with HIV/AIDS. It was thought-provoking exhibit. I also liked the Treasures of European Decorative Art and Sculpture rooms – including a completely transferred salon from 18th century Paris, The Salon Dore. I felt like I’d stepped back into Versailles for a moment. I made my way home after this. Yesterday, I didn’t do much. I got my phone fixed (yay) so I can do texting and get voicemail messages again. I watched a couple of movies and went grocery shopping. Today, I went and did the National Museum of Women in the Arts as it is free the first Sunday of every month. It’s a good thing too – I would have been angry if I’d paid for this museum. It was just not worth it to me. First of all, it felt like a highly disorganized museum, there seemed to be no natural flow to see everything by. Also, the lighting was not the best at times. I don’t mind when it means I can’t take a picture, but at times, the natural lighting combined with the chandeliers meant I couldn’t see the painting itself very well. This may be because, unlike many museums, this one had all the pictures with glass over them. However, I was glad for it when several unsupervised kids were reaching up and touching to see if they would get in trouble. Ugh – children in museums is fast becoming a pet peeve of mine. They always look bored and so they try to amuse themselves by annoying everyone around them. The only museum they seem to like, that I’ve noticed, is the NMNH which makes sense, dinosaur bones and rocks they can climb on are more kids’ styles. Overall, I was also unimpressed with the NMWA’s collection in general. There were a few pieces I liked but most were uninteresting to me. I understand it is a small museum so they rotate what is on display a lot – maybe I caught a bad rotation? I am certainly glad I took advantage of the free Sunday to visit though. This week I probably won’t be doing too much. My family is in town this coming weekend so I need to do laundry and get things organized for that. I may try to sneak the Phillips Collection in on Thursday since it’s open late but if I get pressed for time as I have a report due this week, that may be moved again to a different week. Hope everyone has a great week!! Luckily, I have only during the day on Saturday to write about and then this week and I am all caught up! After I finished at the Folger, I crossed the street to the Library of Congress. It seriously is one of my favorite buildings in DC. It has the unassuming green dome terraced, with the fabulous fountain out front and Minerva everywhere (they insist on the Roman names here so I will grudgingly use them – the Greek ones are prettier). I wondered in and just missed the start of the tour but since I couldn’t see the Main Reading Room without a tour, I nonchalantly joined one in front of the Guttenburg Bible. I really enjoyed my tour actually. The tour guide was this adorable old woman who knew everything about every mural, stone bust and painting in the place. The Main Reading Room is sadly under refurbishment at the moment so sections of it are covered in scaffolding and sheets. But it was beautiful to finally see it in person after seeing it in the movies for so long. After the tour disbursed, I wondered Creating the United States which had drafts of the Declaration and Constitution on display along with countless letters and journals. I then found Thomas Jefferson’s Library. It is a reconstruction of Jefferson’s original library that he sold to Congress to start their library. It was a nice tie-in to my visit to Monticello last weekend though I wonder were exactly all those books fit at Monticello… I then walked through an exhibit on the Exploring Early America – lots of maps and arguments over who gets what land in the New World. There was a very neat case on pirating in the New World though. After this, I wondered downstairs and into the Bob Hope Gallery, focusing on Bob Hope but also looking at Vaudeville and Hollywood in general during his time. I saw yet another Oscar – seen a lot of those lately. I then shopped (of course – they had a book store people…) and picked up a great read on the presence of American Women in the Library. I then went and got my Reader’s Card for the Library in the Madison Building so I can actually go and use the Library now if I want to which I am excited to do. I just need to figure out when exactly I am doing that and what I want to look at. The woman who did my application for the card gave me the name of a fabulous woman’s history librarian so I hope to get a hold of her and look at some of their woman’s collections. Maybe store up an idea for a thesis for when I get back to school for my woman’s history masters…. This week has been fairly standard at work – I’ve been scanning all week with the new resolutions the Smithsonian just approved so my pictures take twice as long to scan now but I did the Kennedy files this week which were fascinating to look through and read all the newspaper clippings (like, FYI, did you know the Kennedys had a child die 20 hours after birth while in the White House? I didn’t even know little Patrick Bouvier Kennedy ever existed…that family really is cursed.) We did have our staff picnic yesterday. They shut down the Folklife Festival to the public for the day and give us the run of the place. This year the tents are Texas, Bhutan and NASA (as it’s their 50th anniversary this year). We ate at Texas – Taquitos but I want to try Bhutan when I go this weekend. Hopefully I don’t murder any tourists before then. I cannot wait for the Fourth of July to be over and done with – too many Americans around for my taste. Most of the time I’ve noticed, the tourists come from outside the States. One day, eating lunch in my favorite spot, I didn’t hear English anywhere around me. I like it that way – ugh, Americans. I will report on the Fourth of July next. I cannot wait for this fireworks show!!!!! So we all know that Christmas comes directly after Halloween. In fact, according to Hallmark, that evil card company that likes to make up holidays to make money and depress those of us who are single, Halloween doesn’t even rank that high anymore. Its Christmas ornament display started going up at the beginning of October people. How ridiculous is that? Now, don’t get me wrong. I adore Christmas. It’s my favorite time of year. I loved it so much as a kid my dad had to make a rule to limit my Christmas music playing fun. Not until the day after Thanksgiving could I pull out my extensive collection of Christmas music. There is a radio station in this city that started playing carols on November 1st. So much for Thanksgiving. Now, on to my latest adventure. Today I explored Frankenmuth, Michigan, or as it has cleverly nicknamed itself “Little Bavaria” (i.e. Tourist Trap in the middle of nowhere Michigan). It’s a cute little town. I did for a moment think I’d stepped into some little chalet town of Germany. It has a charming architecture theme, an impressive covered bridge and more chocolate hauses (sp?) then I knew one small town could hold. However, the town is not the main attraction. Frankenmuth is home to the world’s largest Christmas store. One and a half football fields big. As my friend said when we entered the store, it is Christmas on Steroids. The girl who adores Christmas all of the sudden discovered it was possible to have too much of it. It wasn’t just that this was Christmas on Steroids, this was a Christmas explosion, of sensory overload, of a holiday so far beyond steroids it makes that enhancement look tame. One simply does not know where to look first. Not too mention there are hundreds of people moving in every direction possible. The store was not big on a traffic flow. Theme-wise, and this from a girl raised on Disney theming, less is more is a good rule of thumb. You have shelves upon shelves of ornaments, lights, Christmas trees, giant reindeer for the front yard. That speaks for itself. You do not need to line every inch of the upper walls and ceilings with Christmas bric-a-brac as well. I felt like I was under attack and the ceiling of friendly polar bears and penguins, cheerfully decked out in lights and garland, was coming down on me if I did not start filling my basket immediately. That said, if I even need to find an ornament for my flamingo loving friend or a relative who can’t get enough of his John Deere tractor, I will know where to go. If you cannot find it in Frankenmuth folks, it cannot need to exist. So enjoyable though it was to find a place so near devoted to my favorite holiday, I would have to say once a year will be more than enough to visit that Christmas Wonderland. After awhile a headache ensued from the colors and lights and sounds. Not to mention I’ll be singing “We Need a Little Christmas” for the next week before I can drown it under my own personal Christmas faves. So join me now if a moment of silence for our dearly departed Thanksgiving holiday. How we do miss you and the buffer zone you placed between us and this out of control commercialized Christmas that engulfs us from October until January (who are we kidding? We shop for it all year long). Personally, I’ll keep to my dad’s rule. Even the girl who loves Christmas (I mean, I can recite “Yes Virginia, There is a Santa Claus” off the top of my head…) realizes there is a limit to even her holiday tolerance.